This matchbook as a slightly glossy exterior printed mostly in yellow, blue and green. 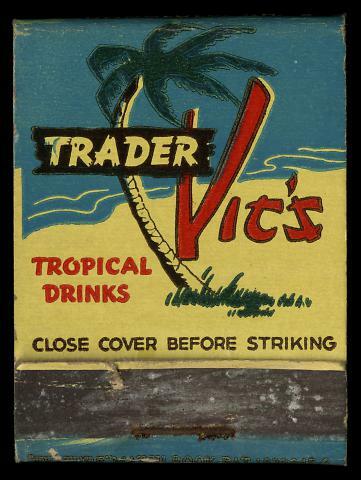 The front reads: "Trader Vic's" Tropical Drinks (the last three words are printed in red). The top of the matchbook "6500 San Pablo Ave, Oakland, California, Honolulu, T.H." The back is an illustration of a man in blue trousers and a striped T-shirt sitting on a box, with a young woman seated behind him wearing a bra and a sarong. They are on a beach with two barrels in front of them. Two men (one in trunks) are moving a third barrel into a tropical warehouse with many palm trees behind it. Although Trader Vic's opened in Oakland in the mid 1930s, the graphic design of this matchbook is from a later date. Trader Vic's is the home of the "Mai Tai." 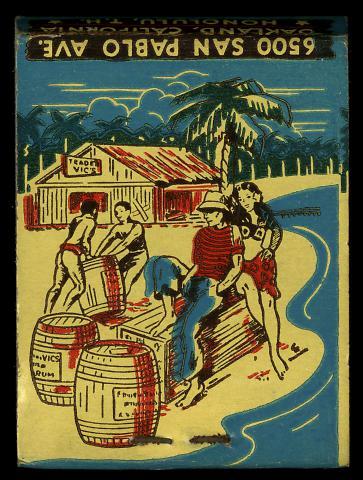 This matchbook was made before Hawaii became a state ("Honolulu, T.H. ").